When to Join IIT JEE Main and Advanced Coaching? When to Join IIT JEE Main and Advanced Coaching? When to Join IIT JEE Main and Advanced Coaching? Everybody knows IITs are one of the best educational institutes in the country. For students, the motivation factor to clear IIT-JEE is the experience of IIT life and the diverse opportunities and skills they get to learn in an IIT campus. For parents, it can be the record packages and a secure future. There are three key questions related to IIT-JEE coaching that almost all students and parents go through. Let’s see them one by one. Why IIT-JEE Coaching is required? It’s the first question students and parents think of when IIT-JEE preparation comes to mind. Luckily these days we have so much information about IITs and JEE that everybody aware of the intense competition in IIT JEE. If you don’t prepare well, you will stay behind, that’s the simple logic behind the need of coaching for JEE preparation. I am not saying that you can’t clear IIT-JEE without coaching, you can definitely do that. But on average, out of 50, If 1 student clear JEE without coaching, 49 of them do it with the help of coaching. @AnjaliMody1 @IIITDelhi Claim on JEE form is 50%. But in reality it is perhaps more like 5%. Coaching is very necessary as without the right guidance aspirants are mostly clueless about the right preparation strategy. They may not get through the right study materials and mock tests. Even if one opts to solve the test papers himself, getting them checked by mentors and following their feedback is very important. When to Join IIT JEE Main Advanced Coaching? It’s a tricky question (decision) for students and parents. 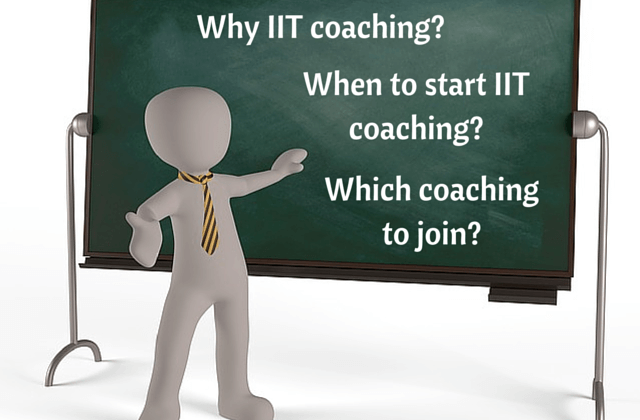 When should we join coaching for IIT-JEE? There is no best possible answer for this. The NTSE 2015-16 (Stage-1) topper of Delhi region, Simarpreet Singh Saluja, have joined coaching early. JEE is his main aim and he wants to pursue CSE from IIT Delhi. Many coaching providers have batches running for class 8 students for JEE preparation. Is it too early for a student to be part of the competition? The thing we have to look here is, when we talk about IIT-JEE coaching program for class 8 student, it’s not the actual JEE preparation (JEE syllabus). It’s about building a solid foundation for JEE Exam. Simarpreet got the benefit of early coaching which helped in the development of his IQ, Logical and Analytical Thinking. And it’s not about just JEE, a student also gets prepared for JSTSE, NTSE and various Olympiads through these coaching programs. Ideally, foundation programs for class 8, 9, 10 are beneficial to students preparing for IIT JEE, at the same time there are students who starts IIT-JEE preparation in class 11, join a 2 year coaching program, and clear JEE easily. A student can also clear JEE with only 1 year preparation by putting lot of effort and hard work. My advice for parents is, whether a student is in class 8, 9 or 10, and if IIT is the target, enroll for a foundation course. Monitor the student’s progress in starting year, and then decide whether you want to go ahead or not. It should be a student’s decision whether he/she want to continue with it. Which Coaching to join for IIT-JEE Preparation? Despite of a tough student’s life, Kota is still the first place that comes to mind for IIT JEE preparation. Delhi and Hyderabad are also the popular choices for students. Most of the coaching institutes have branches in major cities but the quality of faculty is not the same in all. The process in all of the big coaching institutes is similar, first they take a test, and based on the performance, they will allot you a batch. Higher batches are called as “Toppers” or “Rankers” batch. If you don’t perform well in admission test, they will put you in a lower batch (with average faculties). During the course, you can move to higher batch if you score well in monthly or quarterly tests. Then there are online coaching providers like Mystudycart, which are getting popular as they have been able to transform a traditional classroom into a digital medium and providing IIT JEE preparation at student’s home only. Mystudycart delivers live JEE online classes with two-way interaction between teacher and student. Finally, just remember that, whichever IIT-JEE coaching you choose, it will not guarantee you a seat in IIT. Clearing IIT-JEE is a journey of lot of hard work and determination. Wish you all the success ahead!